Turns out, you can ferment ginger, water and sugar in the same way that you ferment water and flour for bread, as a sourdough starter. Why, you ask, would you want to ferment ginger and sugar, and feed it every day? Healthy, fruit infused soda, loaded with beneficial bacteria that feeds your stomach, healthy enzymes. And — it gets better– a ginger bug creates fizz!!! Homemade fizz! So much fizz that you have to worry about the pop bottles EXPLODING!!! I’ll explain how to prevent that in a future post. Keeping a ginger bug is like having your own soda stream… for free. Healthy soda. It’s such a big hit, my oldest son is thinking about bottling it and selling it at college. However, I explained, you are “fermenting fruit,” and we are on a slippery slope to creating alcohol, and there is that danger of explosions. For, that, you’ll need a monitor. This means you can lacto-ferment any store-bought juice, including your own iced tea, or a smoothie. You’ll need 3 days (in warm weather, will take a few days longer in the colder months) to get your bug going. A nice, pretty glass bottle. Something you won’t mind having sitting around on your counter all the time. A loose-fitting cover — like a coffee filter, with a rubber-band, to keep fruit flies away. 1/4 cup of ginger bug feeds 1 quart of juice. Combine all the ingredients. Give the bottle a little shake, and let it sit — not too close to your sourdough starter. Tomorrow, add a teaspoon of sugar and about an inch or so of ginger, and give it a little shake. Continue feeding sugar and ginger until you see the bubbles forming in the bottle — without being shaken. In about 3 days, you will start to see little bubbles around the top of the water. This means it’s ready! Maintain your ginger bug each day, with little feedings of ginger and sugar. Add a splash of molasses once in a while to feed it some extra nutrients. Once your ginger bug is “full” of ginger, you can cut back on the ginger feedings, feeding only with sugar, and adding ginger once a week. Give yourself a break from it by putting it into the fridge — just like your sourdough starter. When you are ready to make more soda, pull out your ginger bug from the fridge — it may be ready to go– just check to see if there are bubbles forming when you let it sit. If not, let it warm up for 24 hours, and feed it every 12 hours until it’s bubbly again. I store my Ginger Bug is a wine bottle, and use a coffee filter to keep it covered, while still allowing air in. When I store it in the fridge, I use a cork to seal it — if the carbonation builds up too much, the cork flies off, and prevents explosions. When you use your ginger bug for soda, (you will need 1/4 cup of ginger bug per quart of soda), replace with an equal amount of water to go back into your bug, and add a bit more sugar and ginger. (For full instructions on making Ginger Bug Soda, click here.) 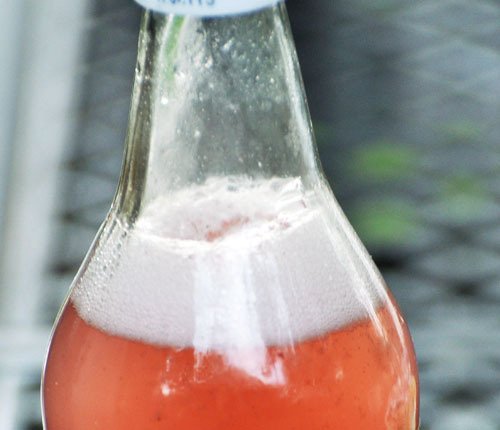 Depending on how much is used from the bottle, you may need a couple of days to get the bubbles back before it’s ready. (That’s why I have two going at the same time. It’s summer, it’s hot, and we’re drinking lots of juice.) Once this ginger bug is made, it can be kept alive and used continuously to make healthy soda at any time. Looks Delicious. Thanks for sharing this. I want to making this Sodastream at my home.